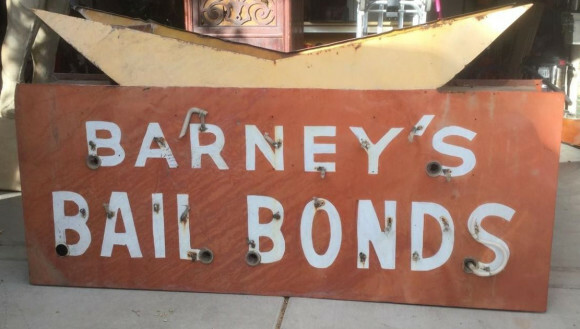 An old neon porcelain sign for sure, the Barney’s Bail Bonds signs are often faded and ripped apart. Since this was a very specialized sign, they aren’t seen too often. That doesn’t mean that they are rare, though. This neon was a double sided porcelain sign.The sign measures 60″ by 33″. The sign is red, but the top has a die cut portion that is a muted yellow color.